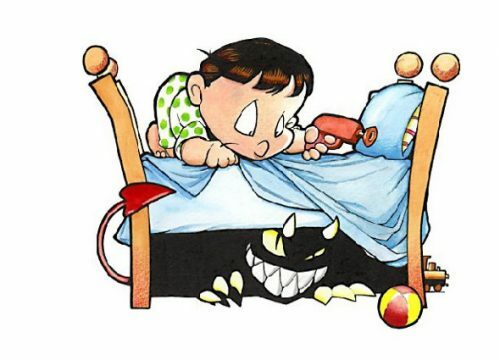 As a small child the most scary thing about going to bed was the monster hiding under there. Are they there to scare you or are they hiding there because they think that you’re the scary one? Do they just want to get on with their lives? Who knows. Your parent’s always tell you that they are scary and do nasty things to you. You believe them. Why not change that and try and make friends with them. They will probably not answer you as they seem to be as scared of you as you are of them. If they do answer, who knows what fun you could have. It’ll be a great friend to have when you go out on Halloween or if you go to a comic book convention. You could win every time for the best costume. Scare your little sister by getting him to hide under her bed for a while. Hours of fun could be had. On the other hand, I can offer a different method of removing the threat. Instead of having a night light, why not use a piece of advice from a young boy named Calvin. Threaten them. If they lie to you then tell them you have a flame thrower. They can’t see it from where they are. It should be enough of a threat to make them think twice about using your bed to hide under. Another method would be using a poker. It has a couple of advantages over the, above mentioned, flame thrower method. Firstly it doesn’t leave any charring or destruction of your bedroom. Secondly it’s a little easier to wield to make sure you get to every area that you can’t see, or don’t want to see. They also come in a size that can be easily stored in the cupboard. Other weapons, especially firearms, would be frond upon as that could do more damage to your house or people around you. Just put the gun or mines back into the shed. You could always try and force them out by themselves by laying a trail of monster food from your bed to the door. Monsters cannot ignore this sort of tasty monster treats. I’m not sure what the best thing to use as I never needed to do this. Your parents will be the best people to ask about this. Just remember, they maybe as scared of you as you are of them. If you remember that then both of you can live together peacefully. It seems to be humans that need to get the monsters removed. Why not just leave them be. Every living thing has their own area to live. 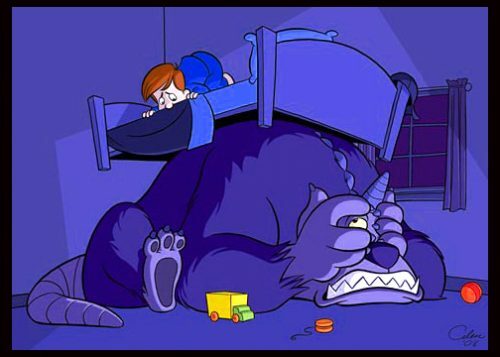 Just think that the dark under you bed is that location for monsters.